Year 1896 (MDCCCXCVI) was a leap year starting on Wednesday (link will display the full calendar) of the Gregorian Calendar (or a leap year starting on Monday of the 12-day slower Julian calendar). 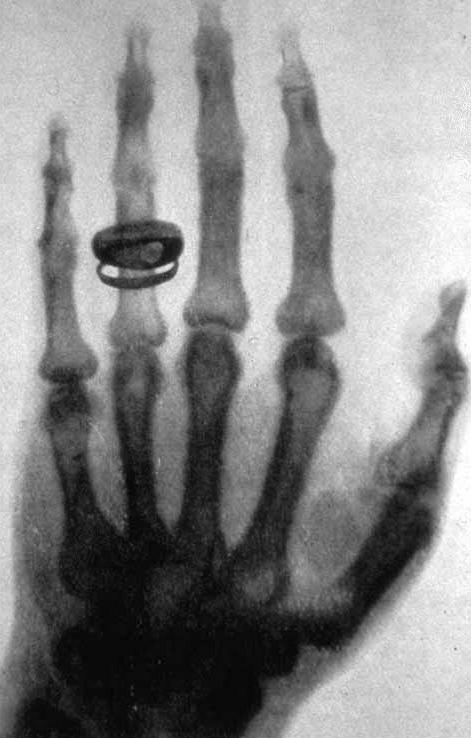 Roentgen X-ray (23 Jan. 1896). The opera La bohème premieres (Turin). Walter Arnold, of Kent, England, is fined for speeding in excess of the contemporary speed limit of 2 mph. March 1 - With the Battle of Adowa, Ethiopia defends its independence from Italy. April 3 - First edition of Italian sports newspaper La Gazzetta dello Sport is published. April 6 - Opening ceremonies of the 1896 Summer Olympics, the first modern Olympic Games. May 8 - Cricket: Against Warwickshire, Yorkshire sets a still-standing County Championship record when they accumulate an innings total of 887. May 18 - The U.S. Supreme Court rules in Plessy v. Ferguson, introducing the "separate but equal" doctrine and upholding segregation. May 27 - The costliest and third deadliest tornado in U.S. history levels a mile wide swath of downtown St. Louis, incurring $2.9 billion (1997 USD) in damages, killing more than 255 and injuring over 1,000 people. June 12 - J.T. Hearne sets a record for the earliest date of taking 100 wickets. It is equalled by Charlie Parker in 1931. June 15 - Earthquake and tsunami in Sanriku, Japan, kills 27,000. July 27 - A causeway is opened between the islands of Saaremaa and Muhu in Estonia. August 16 - Skookum Jim Mason, George Carmack and Dawson Charlie discover gold in the Klondike. August 27 - The shortest war in recorded history, the Anglo-Zanzibar War, starts at 9 in the morning and lasts for 45 minutes of shelling. September 15 - Crash at Crush train wreck stunt. September 22 - Queen Victoria surpassed her grandfather King George III as the longest reigning monarch in British history. October 5 - After a long siege, Brazilian government troops take Canudos in north Brazil, crushing Antonio Conselheiro and his followers. October 30 - Augusta: Augusta High School corner stone laid marking the end of the Augusta Methodist College. November 6 - Hale Johnson runs as vice-presidential candidate for Prohibition Party. November 30 - A large carcass, later postulated to be the remains of a gigantic octopus, is found washed ashore near St. Augustine. December 25 - John Philip Sousa composes magnum opus, "Stars and Stripes Forever" on Christmas Day. France establishes an administrative post in Abengourou, Côte d'Ivoire. Clarkson University is founded in Potsdam. 205 people were married in 1896. There were 0 military battles in 1896. This page uses content from the English language Wikipedia. The original content was at 1896. The list of authors can be seen in the page history. As with this Familypedia wiki, the content of Wikipedia is available under the Creative Commons License.